The DC’s Legends of Tomorrow stars Victor Garber (The Flash), Brandon Routh (Arrow, Superman Returns), Arthur Darvill (Doctor Who), Caity Lotz (Arrow), Ciarra Renee (Pippin), and Franz Drameh (Edge of Tomorrow), with Dominic Purcell (The Flash) and Wentworth Miller (The Flash). Based on the characters from DC Comics, the new series hails from Bonanza Productions Inc. in association with Berlanti Productions and Warner Bros. Television. Greg Berlanti serves as executive producer alongside Marc Guggenheim, Andrew Kreisberg and Sarah Schechter . 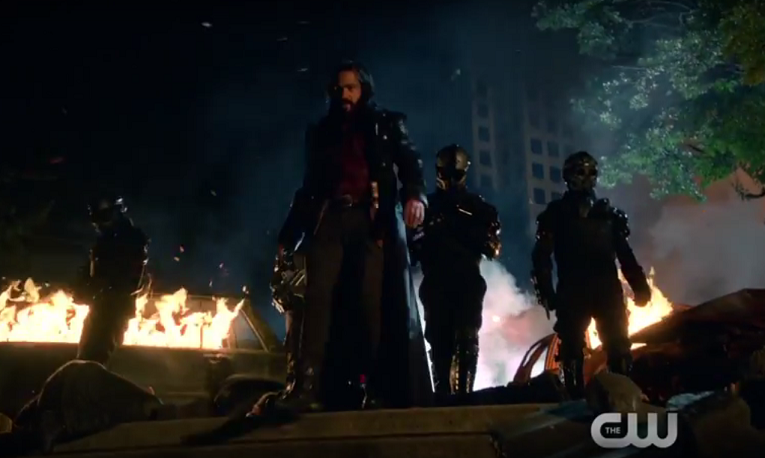 In 2166, immortal DC staple villain Vandal Savage (Casper Crump) rules the entire world. So time-traveler Rip Hunter (Arthur Darvill) puts together a team of superheroes to traverse spacetime in order to prevent Savage from seizing total control. The rest of the nine-person team includes: The Atom/Ray Palmer (Brandon Routh), White Canary/Sara Lance (Caity Lotz), Heat Wave (Dominic Purcell), Captain Cold (Wentworth Miller), Hawkman (Falk Hentschel), Hawkgirl (Ciara Renée), and Firestorm—the new team of Martin Stein (Victor Garber) and Jefferson “Jax” Jackson (Franz Drameh).